U.S. residents are among the top consumers worldwide when it comes to energy use at home. Our usage behavior and habits contribute tremendously to depleting natural resources and increasing our energy expenses. Out of all the energy a typical home uses, heating usually makes up one of the major components, amounting to around 50 to 70 percent! 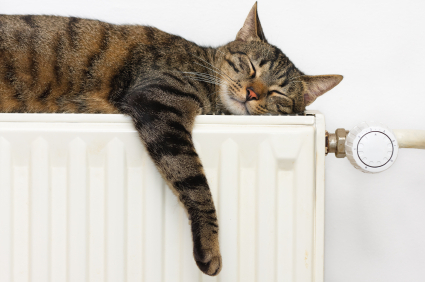 There are actually a number of fairly simple ways in which homeowners can reduce their heating costs. Often it does not necessarily involve turning down the heat at home, but simply minimizing the amount of heat that escapes from the building. Read on to learn more about how to assess how much you already spend on heating and how to bring that number down. Adding a layer of insulation in key areas of the house is an excellent way to help keep existing heat within the building. It reduces the amount of air that moves in and out of the house. Good spots for insulation include attics or roofs, as well as around doors and windows. Fiberglass or fiber insulation sheets, known as batts and rolls, are easy enough to be installed by homeowners. Other types of insulation include foam spray, or loose fiber fill that is blown into gaps and crevices. These types of insulation are best handled by professionals who have the right equipment and training. An easy do-it-yourself test for air leaks indoors is to walk around with a lit incense stick and stop at key points. When the smoke starts to drift sideways rather than rise upwards, that is an indicator that there is an air leak nearby. The most common spots for air leaks are around electrical outlets, doors and windows, basements, and attics. The paper test is a different technique that helps homeowners to quickly check whether their doors and windows are letting in cold air. Try to slide a single sheet of paper underneath or through the sides. If it can pass through without any tearing, it means that air can also pass through. Another method of testing for air leaks is with a blower test. This is a check performed by professional energy auditors with certain diagnostic tools. For a fuller overview, try a home energy audit. Once again, this requires an energy audit to tour the home and assess it for air leaks and general energy use in different areas. While some air leaks might need to be professionally handled, smaller ones can be sealed with caulking. This is a type of material that expands and sets when applied. Caulking applicators usually come with a long, fine tip that is easy to insert into small cracks. Cutting down on heating costs for a house are often quite inexpensive, although there are a few that do require an initial investment. For example, installing programmable thermostats like Nest helps by automatically managing indoor temperatures. On the other hand, solar heating systems are an effective way to use the sun's energy to provide heat for the house. Other ideas are simpler but also extremely effective. By cleaning vents, ducts, and air filters, homeowners can increase the efficiency of their heating units. While it may sound redundant to turn on a fan in winter, this technique really is helpful. Since hot air tends to rise, fans can disperse the hot air throughout the room or house and help to maintain a more consistent temperature. On sunny days, open the curtains to let sunlight warm up the house. After sunset, close the curtains to prevent heat loss. Heavier curtains are more effective against heat loss than thin ones or sheers. Similarly, install a curtain screen between the entrance hallway and the rest of the house. This way, when people enter or exit in winter, cold air is limited from quickly whipping through the interior. Doors that have air leaks can be modified with an attached door sweep. This is a piece of flat rubber that is mounted to the bottom of the door to help block the air leak. Finally, homes with non-electric fireplaces have the option of burning logs, a cheaper and renewable resource, for heat instead of always resorting to electric heat. Solar Heating – Learn about how active solar heating systems can be used to heat spaces and even water. Air Leaks – Find out how to locate and seal air leaks and leaking ducts, add insulation, and improve indoor heating in other ways. Efficient Heating (PDF) – This guidebook for residents discusses how to maintain the temperature of a house effectively while conserving energy. Insulation Tips – Read an online guide that covers all the facts and instructions of insulating a house correctly. Caulking – Caulking is a fairly easy and inexpensive way to seal air leaks around the house. Reducing Heating Costs – Find practical tips on how to decrease home heating costs without sacrificing indoor temperatures.